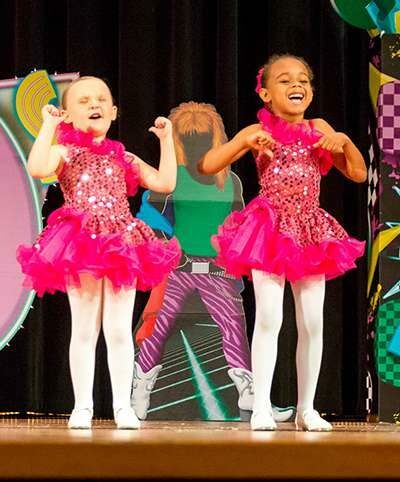 Greendale Dance Academy offers a variety of classes for dancers ages 18months+ (Toddler Classes begin at age 18 months) ages 3+ in many popular styles including ballet, tap, jazz, acrobatics, musical theater, pom, hip hop, lyrical and more. Dancers interested in Competition Team should contact the studio directly. *If taking both of these classes, bring snack and have story time between classes with Miss Melissa. Download a class list below. This is a GYMNASTICS class focusing on floor skills, stunts and tumbling. Dance is also incorporated to round out this popular class. Attire – Black leotard, black, pink or tan tights, and Capezio EM1 Agility Gym Shoe (advanced classes are bare feet). Ability Level – Is based on a student’s ability to perform certain skills, like back handsprings and tucks. This class is designed to develop skills in classical ballet. Correct French terminology is employed and dancers are encouraged to use and apply it. Attire – Black leotard, pink tights, ballet skirt that lies above the knees (optional), and pink ballet slippers BLOCH S0203 PINK BALLET SLIPPER or pointe shoes (Boys – black shoes). Ability Level – Is at the teacher’s discretion. This class is for boy ages 7-12. Mr. Tee teaches a high energy, fun filled Hip Hop class that will include some break dancing too. This class meets Wednesdays at 5pm for 1 hour. Attire – Black sweatpants or shorts and black or white shirt. Shoes CAPEZIO DS03 BLACK DANCE SNEAKER. A style that tells a story through the emotional connection with the music and lyrics. Contemporary is inspired from ballet, lyrical and jazz. A fun class for dancers ages 3-5 that stimulates children’s creativity through an exploration process while discovering the basic elements of dance. Creative Movement classes are geared towards Pre-School and Kindergarten dancers. Ballet, Tap, and Acrobatics are introduced. Attire – Any colored leotard, any colored tights, pink ballet slippers BLOCH S0205 (Boys – black), white (boys black) tap shoes SODANCA TA-35 (with sewn elastic ties or button ties). Attire- Black leotard and pink or tan tights. Ballet- BLOCH S0205 (S0203 is ok) Pink Ballet Slipper, Tap- S0302 Tan Tap Shoe (Boys Black), UPDATED- Jazz/Acro- Capezio EM1 Agility shoe. A class designed for boys and girls. Learn how to street dance and dance like those in videos. A free style form of dance that emphasizes precision, freedom, and high intensity of movement. Class always begins with a series of exercises to build flexibility, strengthen, and avoid possible injury. Attire – Black leotard, black, pink or tan tights, and BLOCH 401 SUPER JAZZ SHOE IN TAN. A form of dance where emotion is express through dance. Attire – Black leotard, black, pink or tan tights, and Capezio Foot Undeez. A dance style used in Musical Theater Productions. Students will learn to dance and act in the role of a character. Note: The Ballet or Jazz Class requirement has been dropped. This class can be taken by itself. The ultimate in ballet technique for the female ballet dancer. The instructor will decide if a dancer is ready to dance on pointe. At least one hour of Ballet per week is required for Pointe. Attire – Black leotard, pink tights, ballet skirt (optional), and pink ballet slippers BLOCH S0203 or pointe shoes. Ability Level – Is at the teacher’s discretion and progress in ballet. Strength is extremely important. A type of dance where rhythmic sounds are created by the feet. Attire – Black leotard, black, pink or tan tights, BLOCH S0302 TAN TAP SHOES (Boys – Black Tie Up – Ask office for details). Ability Level – Is based on a student’s ability to perform a collection of steps. We use the Al Gilbert Tap Series. Designed for the developing dancer ages 18 months-3 years and taught by Miss Tracy who holds a degree in Early Childhood Education from Anna Maria College and is Lead Toddler and Preschool teacher certified, this class engages both parents and dancers in movement, play and fun! Classes will include simple tumbling like forward rolls, obstacle courses and basic stretching, all centered around gross motor development. A perfect class for your growing toddler. This class is held Tuesdays from 11am-11:45am. COST ONLY $49 per 1/2 year (Sept-Dec and Jan-May). Attire- For dancers something comfortable that your child can move in. Dance clothes like leotards are optional. For parents, wear something comfortable and plan to wear socks.